Does this classic multiband distortion still cut through the noise? Kombinat has long been one of our favourite Audio Damage plugins, and with its Mix control and improved interface and filter, the third version is nothing less than essential. Delicious filter with 12 modes. 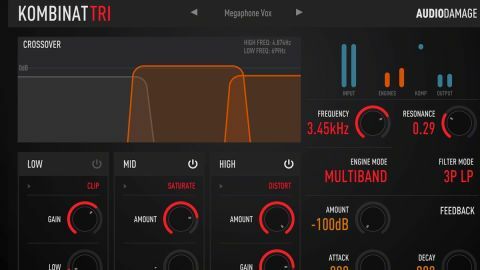 Audio Damage is working through the redesign of its sizeable roster of plugins at quite a pace, and here we’re looking at the reinvigorated multiband distortion plugin, Kombinat Tri, previously known as Kombinat, then Kombinat Dva. It isn’t a complete reimagining of Kombinat’s core premise and feature set, with only a few significant additions made beyond the obvious graphical overhaul. However, as it’s been almost a decade since we reviewed the original, and we didn’t revisit it for the Dva v2 update, we’re going to approach it here from fresh. Kombinat Tri is a three-band distortion plugin (VST/AU/AAX) with a multimode filter and compressor built-in, and few would argue that its GUI – adhering to Audio Damage’s new, calmer design ethos - isn’t an improvement over that of Kombinat Dva. The filter frequency ranges and gain levels of the three bands are controlled in the interactive graphical Crossover display, where each ‘hump’ represents the coverage of its corresponding band, with frequency on the X axis and volume on the Y.
set anywhere from 100Hz to 1kHz. Dragging the top edge of a band up and down, or twisting its Gain knob at the bottom of the interface, meanwhile, sets its volume level, with the range for all three bands being -80 to +12dB. We’re not sure why the crossovers don’t also get ‘mirrored’ knobs. Kombinat is built for live as well as studio usage, and central to that scenario are the per- band on/off switches below the display. Deactivating a band doesn’t bypass its processing - it mutes it entirely, just like hitting a kill switch on a DJ mixer. Each of Kombinat Tri’s three bands houses its own independent Distortion Engine, drawing on a menu of 13 analogue-style and digital distortion types, each with up to three adjustable parameters, and all designed with brutal sound-mangling in mind - see Distortion styles for more details. Two routing schemes determine how the input signal is fed into the Engines: in Multiband mode, they work in parallel, with each band processing its filtered input signal and all three mixed at the output. In Series mode, the input goes through the High band, then the Mid band, then the Low band, which outputs the end result. At the heart of Kombinat Tri are its 13 distortion algorithms, which load independently into the High, Mid and Low frequency bands. At the more conventional end of the scale, Fuzz, Saturate, Clip, Tube Clip and RingMod are your analogue-style essentials, and Distortion expands on Saturate with zero-crossing distortion for a choppy ‘gating’ effect. Rectify attenuates, flattens and flips the negative half of the incoming waveform; X Noise multiplies the input signal with band-pass filtered white noise; Degrade combines bit depth and sample rate reduction, incorporating an Error control for screwing with the bits on the way in; and Wavy improves on Kombinat’s earlier Warp algorithm (which is still onboard), reshaping the waveform based on the influence of a sine wave. On the outer fringes of the list, Nerd Rage is a messed-up reverse delay, while Octaver pitchshifts the input signal an octave up and an octave down before overdriving the hell out of all three. Each algorithm offers between one and three adjustable parameters, controlled via the three knobs below the Distortion menu. Fuzz and Saturate, for example, have only an Amount knob, while Rectify has Slope and Round controls, and Nerd Rage boasts Threshold, Decay and Gain parameters. The practical difference between the two is that in Multiband mode, tweaking the parameters of a given distortion engine only affects the sound of that band, whereas in Series mode, sonic changes made to one band are fed into the next. In a nutshell, Multiband mode gives you surgical control over the distortion across the frequency spectrum, while Series mode is far more ‘blunt’, piling the distortion onto whatever remains of the signal at each stage. The mixed or cumulative output from the distortion engines feeds into a resonant filter, which is where Kombinat’s biggest functional change has been made. We now have 12 filter modes to choose from, expanding enormously on the 12 or 24dB low-pass of Kombinat Dva. This range of models takes in all 11 modes of Audio Damage’s new Grind plugin, which include all the HP/LP standards, plus MS-20 HP/LP models and the algorithms from AD Filterpod and 914, and adds an MS-20 band-pass. It’s a veritable playground of quality analogue filter emulations, from super-smooth to wild, edgy and self-oscillating. The Kompressor knob lowers the threshold on a fixed compressor (1000:1 ratio, 5ms attack) from 0 to -30dB as it’s turned clockwise. After that, an envelope-following feedback circuit can be dialled in with the Feedback Amount knob, the response of the envelope follower timed using the Attack and Decay parameters. Audio Damage describes this particular feature as “somewhat experimental”, and we can see why - it’s an unpredictable effect, but adding satisfying bite and movement when it works. At the very end of the line, the new Mix control sees Kombinat at last able to blend dry and wet signals. About time, too. Although a relatively minor step up from Kombinat Dva, Kombinat Tri’s new filter modes and wet/dry mixing add significantly to the plugin’s creative potential. A bit of filter modulation wouldn’t go amiss, however, and while we love the groovy level meters (Input, Output, distortion Engine and Kompressor gain reduction), they could perhaps do with value scales. But those are blips in another otherwise flawless showing - crucially, Kombinat Tri’s distortion algorithms and filters sound superb, and are wonderfully colourful and responsive. For the artful toughening, transformation and decimation of drums, basses, guitars, vocals and electronic sources of all kinds, and bringing a powerful live mixing element to the DJ booth, this is an effect that every producer and laptop jock should own.